The poem Lily, by Dawn Gorman, is part of the Wiltshire Does Its Bit exhibition. It was written as a direct, fictionalised response to a photograph of real-life munitionette Lily Withers, of Trudoxhill, near Frome. Dawn originally saw the photo, reproduced to near-life-size proportions, at a WWI exhibition in Frome Museum. Subsequently, the following details about Lily have been kindly provided by her grandson, John Beaumont. “Lily Withers was born in 1897, the daughter of a miner in the Somerset Coalfield in Vobster. 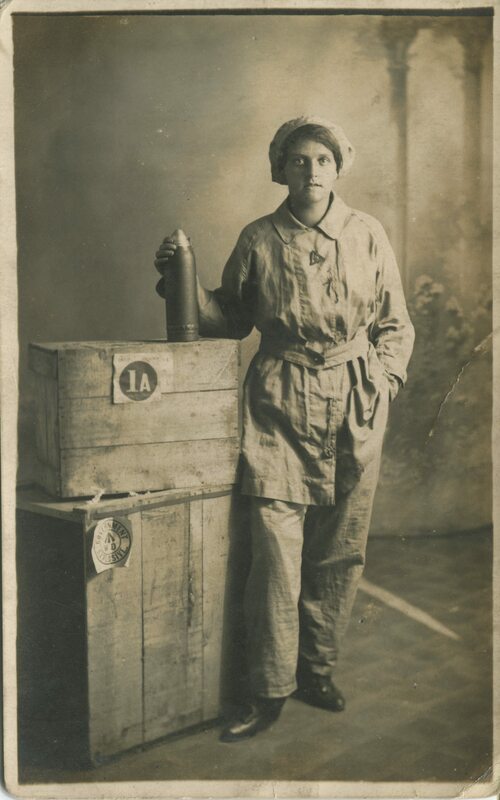 I don’t remember my grandmother, as she died 14 years before I was born… and I don’t associate her with the war effort at all except perhaps as a press-ganged worker [at J W Singer & Sons ammunitions factory in Frome]. In fact her husband, my grandfather, drove military vehicles in France throughout the war and so it is he who I associate more with the war than my grandmother. When people talk about families and the war, I would say that both of my grandfathers and my father fought in wars, but their wives suffered the consequences of wars.